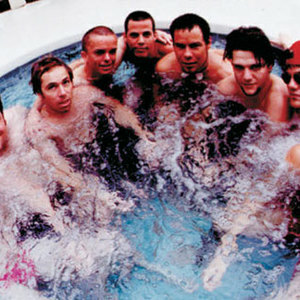 1) Jackass is a punk/country band featuring members of Ill Repute and Bad Religion. They released "Plastic Jesus" LP on BYO Records in 2004. 2) Jackass is an American television series, originally shown on MTV from 2000 to 2002, featuring people performing various dangerous, ridiculous, and self-injuring stunts and pranks. The show served as a launchpad for the television and acting careers of Johnny Knoxville and Bam Margera. They released "Plastic Jesus" LP on BYO Records in 2004. 2) Jackass is an American television series, originally shown on MTV from 2000 to 2002, featuring people performing various dangerous, ridiculous, and self-injuring stunts and pranks. The show served as a launchpad for the television and acting careers of Johnny Knoxville and Bam Margera. Since 2002, two Jackass theatrical films have been produced and released by MTV corporate sibling Paramount Pictures, continuing the franchise after its run on television. The show developed from Big Brother Magazine, a skateboarding-related humor magazine that Jeff Tremaine, Dave Carnie, Rick Kosick and Chris Pontius all worked for, and featured regular contributions from Johnny Knoxville and Dave England, amongst others. The concept of Jackass dates back to 1999 when struggling-actor-turned-writer Johnny Knoxville birthed the idea to test different self defense devices on himself as the basis for an article. He pitched the idea to a couple of magazines and was turned down until meeting with Jeff Tremaine of Big Brother. Jeff hired him as journalist and convinced Johnny to videotape this idea and other stunts for stories. The footage, which involved Knoxville being tasered, maced, and ultimately shot while wearing a bulletproof vest, appeared in the second Big Brother skateboarding movie Number Two. Johnny quickly became a hit. Big Brother would go on road trips, which is believed to be where Johnny met Bam Margera and they became good friends. In addition to skateboarding, Bam Margera had recently released a movie entitled Landspeed:CKY which consisted of himself and his friends in West Chester, Pennsylvania performing various skits and stunts. Jeff Tremaine saw the tapes and drafted Bam and his crew into what would become the cast of Jackass.